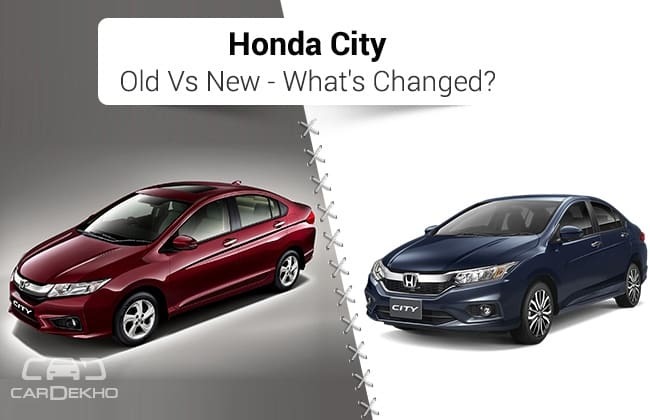 HomeNew CarsNewsHonda City: Old Vs New – What's Changed? The Honda City is one of the highest selling cars in its segment. It is quite popular in the Indian market and is known for its comfort and performance. The current, sixth-gen City was introduced in the Indian market in 2014. However, its facelift has been revealed in Thailand and is likely to be launched in the country in February 2017. A few dealerships are already accepting bookings for the upcoming City whose facelift includes minor cosmetic changes and few new features as well. Let's check them out. The changes in the City facelift are more prominent on the front. Compared to the outgoing City, the new car has a slimmer chrome radiator grille and smaller fog lamp housings. The front bumper has also been modified. The most important change is the tweaked headlamp clusters that house new LED headlamps along with daytime-running LEDs. When viewed from the side, the new and the outgoing City look almost identical, the only visible difference being in the new 16-inch tyres on a new set of diamond-cut alloy wheels. The new City has a more aggressively styled rear bumper with black honeycomb inserts. The revealed Thai-spec City continues to offer the old taillights. However, the Indian version is likely to feature a new set of clear-lens lamps and a rear spoiler with an integrated stop light. There is hardly any visible difference in the interiors of the facelifted City. However, the cabin features a new infotainment system with a bigger screen (seven-inch) and MirrorLink connectivity. Other changes include the addition of LED map and interior lights. Additional safety features like side and curtain airbags, vehicle stability assist (VSA) and a multi-angle rear-view camera are also being offered. In terms of mechanicals, it is being offered with the same 1.5-litre i-VTEC petrol engine coupled to five-speed manual gearbox/CVT and a 1.5-litre i-DTEC diesel engine coupled to a six-speed manual gearbox.